O.k., so I’m feelin generous. You get two posts today. Two-Fer Saturday…that doesn’t sound right, but anyway, I thought I’d put together some plays that Mizzou had against Georgia. For all intents and purposes, Drew Lock, the Tiger QB was probably the best QB they faced. 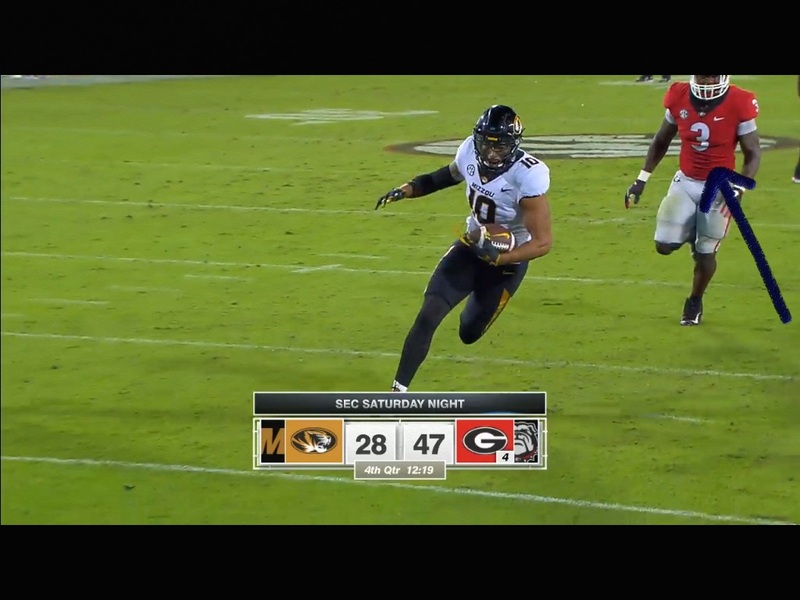 Mizzou didn’t have an answer for the Bulldog running game, and the more I think about it, the more I think that the pundits think that Oklahoma = Mizzou. 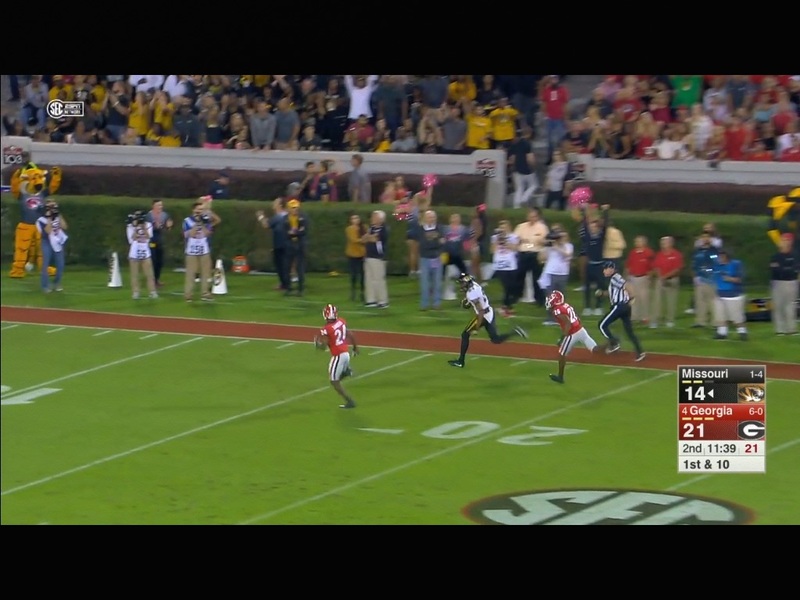 This is what a lot of the SEC homers envision, a Georgia blowout. 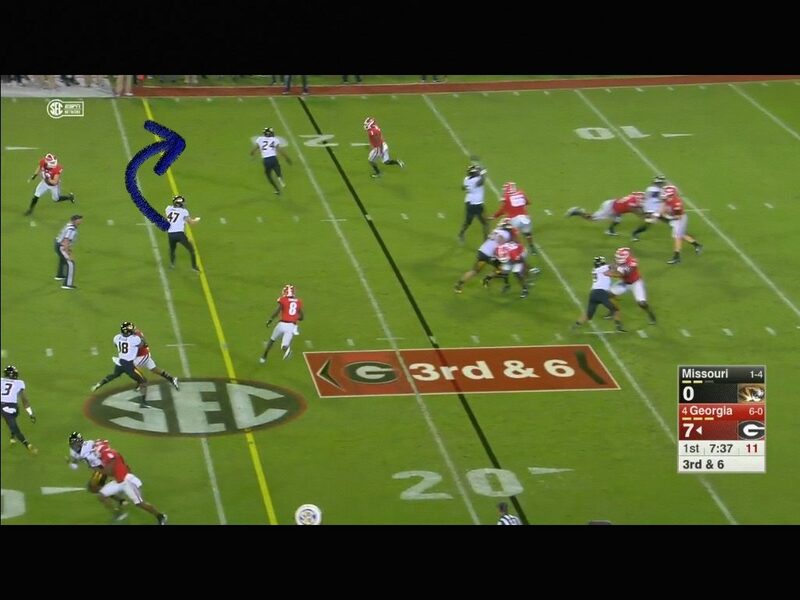 One thing I’ve noticed is that I think that Fromm may decide a little bit where he’s going with the ball pre-snap. He’s got trips to the bottom and a lot more traffic. He’s got a lot of green grass and room to operate for his big tight end to the top. The linebacker does a great job and takes a good drop to pick off the pass. He runs it back down to the five. If the Sooners can disguise coverage a little bit and mix it up, maybe they can get him to make pre-determined reads and get a turnover or two. This is one of those window dressing plays that Riley does so well. 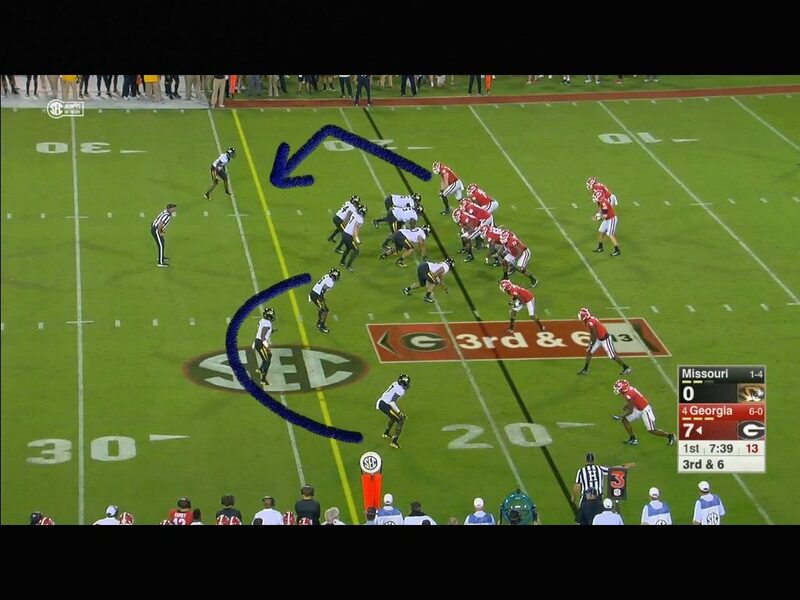 He has a lead option going right, with a shovel pass to the tight end up the middle. The Mizzou OL does a nice job generating movement at the point of attack and the big tight end goes in virtually untouched. 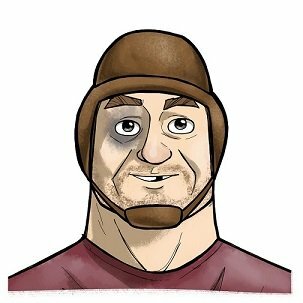 I believe our OL will have success in the run game as long as Coach Riley doesn’t abandon it. 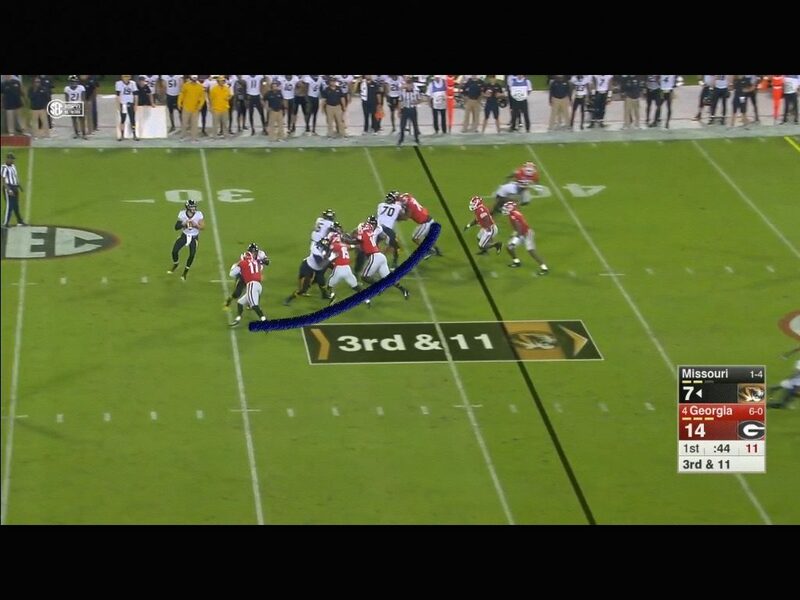 Nice protection here on a 3rd and 11 with an obvious passing situation for the Tigers. And you don’t get more open than that. I’ll bet we see a lot of wheel routes & sluggos(slant & go) routes for the Sooners to start the game. 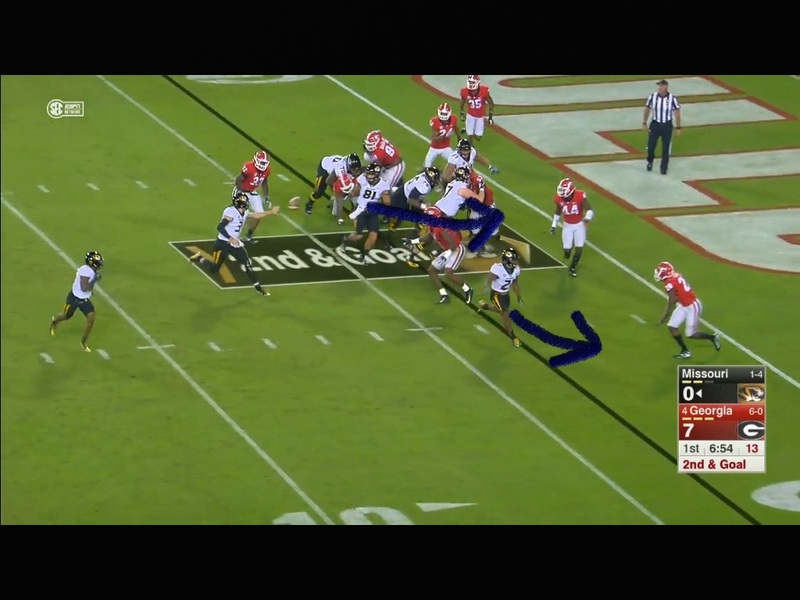 Georgia is going to be flying up to stop the run game, and maybe their aggressiveness will be able to be taken advantage of a bit. This protection isn’t nearly as good for Lock. 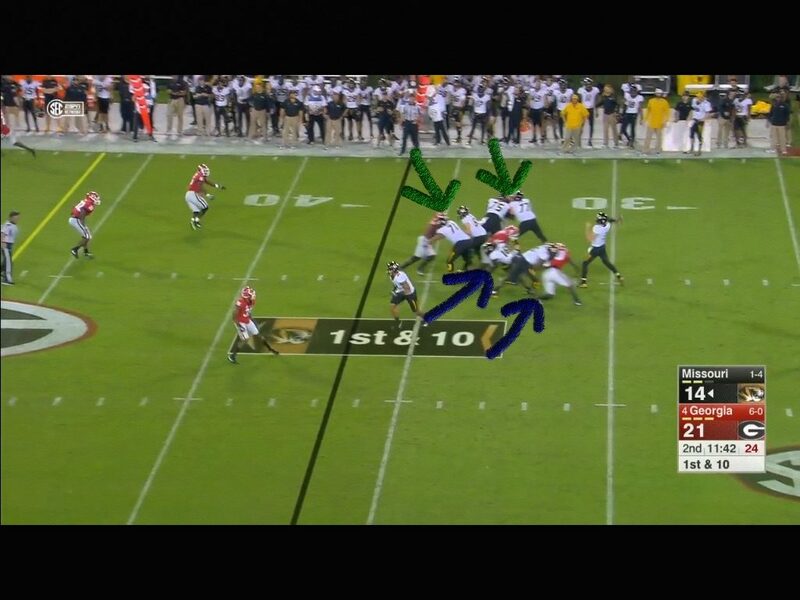 Both of his solo blocks are getting beat to the bottom, while both double teams are solid to the top. Nevertheless he hangs tough in there to let it fly. 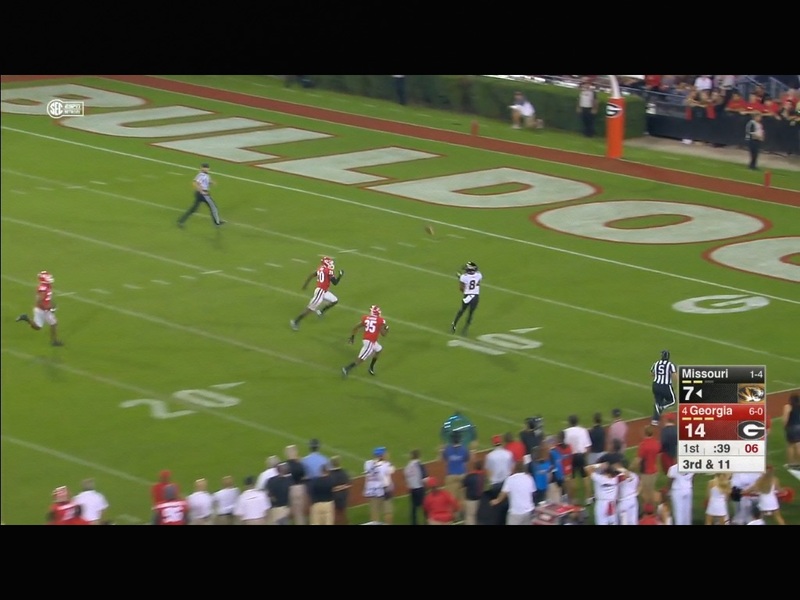 And again the Georgia secondary gives up a big play, but this time on 1st down. If the Sooners can protect Baker, they will move the ball. 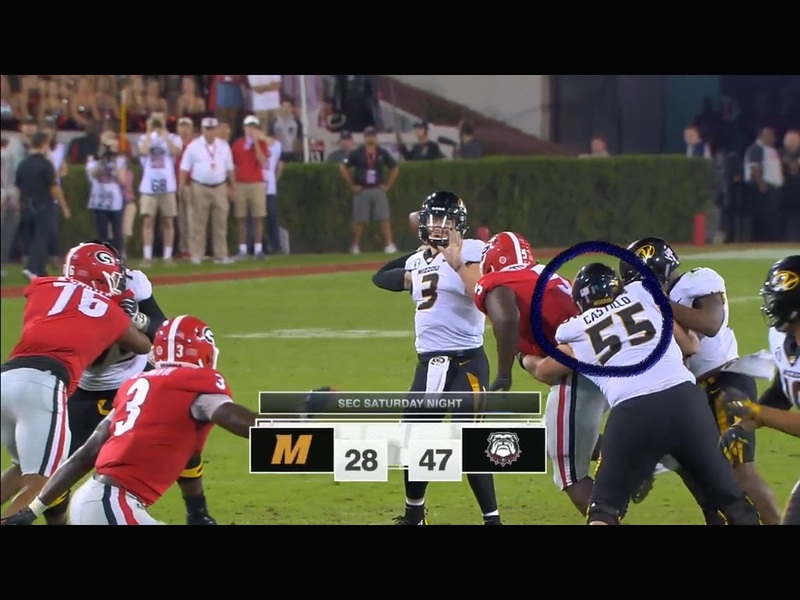 #55 is Trystan Castillo for Mizzou. He’s a true freshman center who made freshman all-SEC. He’s from Webb City, MO, which is where the Wistrom brothers who starred at Nebraska played in the 90’s. Anyway, Bedenbaugh was in on him but never offered because of a guy named Creed Humphrey. Trystan is a good player, but I think our interior OL at this stage of his development is better. Paging Dmitri Flowers, Mark Andrews or Grant Calcaterra! 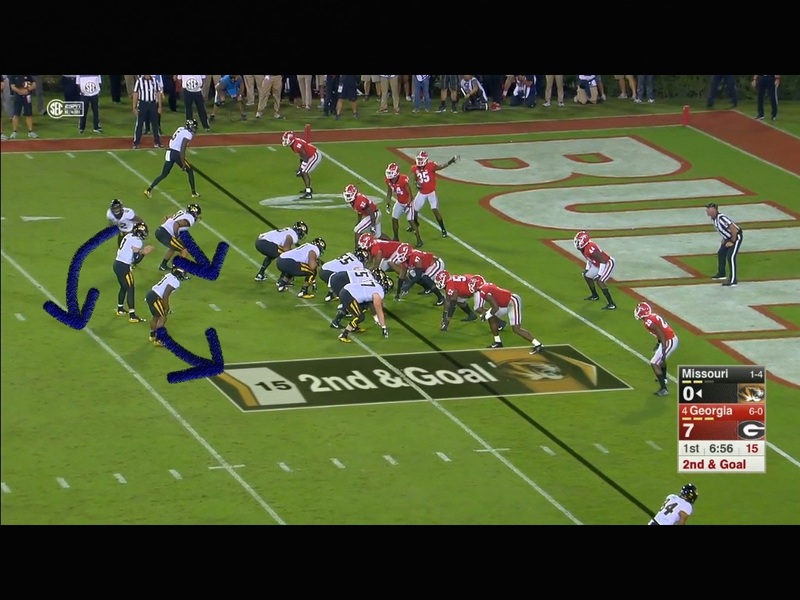 The Butkus Award Winner Roquan Smith gives up the TD on play action. While this game wasn’t close, early on Mizzou was hanging with em. They just couldn’t stop the run. If the Sooners can stop the Bulldog run game they’ll win this game.